Being a child of God is the most wonderful thing in all the world, but the Christian life is not easy. My Heavenly Father knows this, and He has a wonderful answer for my needs. • What is God's greatest gift to me? • What is the secret of victory in the Christian life? God has done many, many wonderful things for me. He forgave me of all my sins. He took me out of Adam's sinful family and put me in Christ's family. He has made me His child. 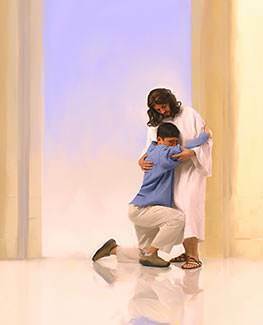 He loves me and accepts me as He loves and accepts His own Son, the Lord Jesus. As wonderful as these things are, they are not God's greatest gift to us. What is God's greatest gift? God's greatest gift to us is Christ! God's priceless gift to every person is His Son. 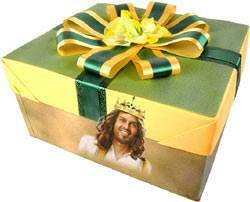 The Bible says, "Thanks be unto God for His unspeakable gift" (2 Corinthians 9:15). God gave Jesus to us to be our Savior. On our part, we must receive Him as our own Savior. How did I become a Christian? I became a Christian by receiving Jesus into my heart. When Jesus "knocked" at the door of my heart, I invited Him into my heart. What did He do? He came in just as He said He would. I was born into God's family by receiving the Lord Jesus as my Savior. That is the only way that anyone can become a child of God. The Bible says, "As many as received Him, to them gave He power to become the sons [children] of God…" (John 1:12). A Christian is a person in whom Christ lives. The apostle Paul said, "Christ lives in me" (Galatians 2:20). Every Christian can say this. The Bible says, "Do you not know yourselves that Jesus Christ is in you…" (2 Corinthians 13:5). Jesus Christ Himself is in Heaven today, seated at the right hand of the Father, but He lives in me by His Spirit. The Bible says, "Because you are sons, God has sent forth the Spirit of His Son into your hearts…" (Galatians 4:6). Instead of giving me a lot of things, God gives me Christ to live in me. The apostle Paul said, "My God shall supply all your need according to His riches in glory by Christ Jesus" (Philippians 4:19). The wonderful Person who now lives in me is God the Son. He said, "I and My Father are one," and "…He that has seen Me has seen the Father…" (John 10:30; 14:9). God has given me the greatest gift He could ever give me: He has given me His Son! • Christ is "Lord of all." We need to see the greatness of God's Son. God has exalted His Son to the highest place in the universe. The Bible says, "He is Lord of all" (Acts 10:36). The Father has put all things into the hands of His Son. The Bible says, "The Father loves the Son, and has given all things into His hand" (John 3:35). Because He is God, Christ knows everything about me. He knows how many hairs I have on my head. He has them all numbered! He said, "…the very hairs of your head are all numbered" (Matthew 10:30). He even knows my thoughts! Nobody ever loved me like Jesus Christ! He loved me so much that He gave His life for me. Jesus said, "Greater love has no man than this, that a man lay down His life for His friends" (John 15:13). Christ loves me just the way I am, but He loves me too much to leave me the way I am. By His Spirit, Christ is living in me, and day-by-day, He is changing me, making me more like Himself. • Christ is always for me. This means that He always wants what is best for me. No matter where I go or what I do, Christ is for me. He is always for me. He is God, and if God is for me, it does not matter who is against me. The Bible says, "If God is for us, who can be against us?" (Romans 8:31). One wonderful thing about Christ is that He is always the same. In the past I have had friends, but somehow they changed, and now we are no longer friends. But Christ never changes! The Bible says, "Jesus Christ [is] the same yesterday, and today, and forever" (Hebrews 13:8). 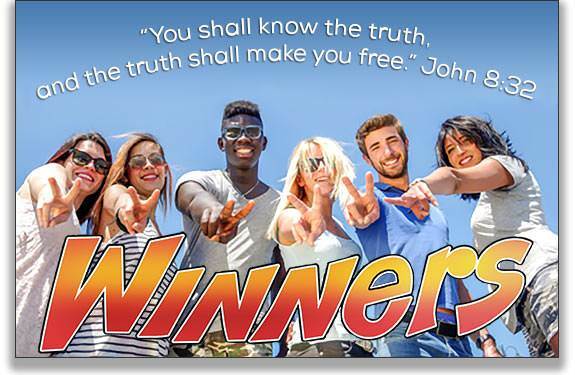 What is the secret of victory in the Christian life? The secret of victory in the Christian life is turning things over to Christ and depending on Him. The apostle Paul tells us about a time in his life when he was utterly defeated. Then Paul discovered the secret of the Christian life. He began depending on Christ who lived in Him. When he turned things over to Christ, he lived in victory. He said, "I can do all things through Christ who strengthens me" (Philippians 4:13). God wants other people, especially those I live with, to see Christ in me. But how do I deal with others when they irritate me? I can try to always be kind and loving, but I have tried this many times and failed. I have a choice. I can try to do everything myself or I can turn things over to Christ. I can say, "Lord, You know the problem I have getting along with others. I am tired of doing things my way and failing. I am turning this over to You. I am going to let You handle things." The Lord loves for us to do this! A baby does not learn to walk by your telling her how to walk. You must put her on her feet and let her try to walk. She will fall again and again, but you must keep putting her on her feet until she learns to walk. The Christian life is like this. Turning things over to Christ and depending on Him is new to me. I must practice doing this! I will fail many times, but Christ will keep picking me up until I learn how to "walk" with Him. You will never know what Christ will do for you until you start turning things over to Him. When you fail, confess it to the Lord at once. He will forgive you! Then start again, depending on Him. Begin doing this today! 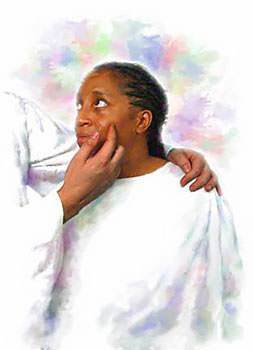 A teenage girl had become a Christian, and she wanted to attend a meeting of the youth group. When she asked her mother if she could go to the youth meeting, her mother became extremely angry and said, "No! You can't go to that meeting! I want you to stay home tonight!" She had a choice. She could have gotten into a big fight with her mother as she had done so many times before. 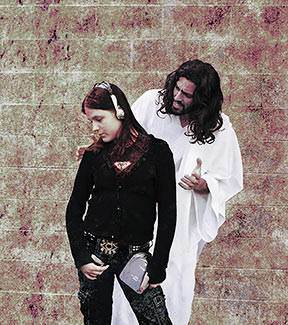 Instead, she decided to let her new Friend, Jesus, handle the matter. She said graciously, "Is there something you would like me to do around the house tonight?" This response shocked her mother. In unbelief she said gruffly, "Yes. Get out in the kitchen and do the dishes!" The girl cheerfully began the project. She was happily washing the dishes when her mother came in. 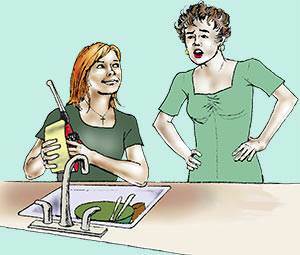 The mother was amazed at the change in her daughter's attitude. She asked gruffly, "Do you have any homework to do?" The girl replied that she had done her homework. Though He is Lord of God's universe, Christ wants to be my Friend. He said, "You are My friends, if you do whatever I command you…I call you not servants…but I have called you friends…" (John 15:14-15). There is no friend like Jesus! At times I am discouraged, but He is always there to help me and encourage me. Many times I do not know what to do, but Christ is God. He knows exactly what I should do. He is never too busy to listen to me and help me. He loves for me to come to Him with every burden. The Bible says, "Cast your burden upon the Lord, and He shall sustain [strengthen] you…" (Psalm 55:22). When I need to know what I should do in a certain situation, I can turn to my Best Friend. He lives in me and He is God. He knows exactly what I should do. He is pleased and even delighted when I realize that I do not know what to do and turn to Him. He loves for me to do this! As I pray and wait on Him, Jesus will guide me. Victory is a gift from God. The Bible says, "Thanks be to God, who gives us the victory through our Lord Jesus Christ" (1 Corinthians 15:57). Victory comes from turning things over to Christ who lives in us instead of trying to do everything ourselves. Even the great apostle Paul himself had one failure after another until he learned this secret. Afterward, he said, "I can do all things through Christ who strengthens me" (Philippians 4:13). Before I began turning things over to Christ, when somebody said something mean to me, I would say something mean back. I knew that did not please the Lord, but I could not help it. Now I have a secret power. Jesus Christ, the Son of God lives in me. I can turn things over to Him. I can smile and say a kind word back. The Bible says, "A soft answer turns away wrath: but grievous [harsh] words stir up anger" (Proverbs 15:1). Perhaps I have a really bad temper. Sometimes I manage to keep from losing my temper for a day or so. Then I lose a BIG temper! I am always ashamed when I do this because I know that I failed the Lord Jesus. What should I do? I should turn my bad temper over to Jesus. I say to Him, "Lord, you know I cannot control my bad temper, so I am turning it over to you. You take control." I relax and let Christ live His life in me. "Before, when the devil came knocking at my door to get me to do something wrong, I would go to the door and say, 'Don't you come in! Don't you come in!' But he would come in anyway. "Now when the devil comes knocking at my door, I say, 'Lord Jesus, will You please answer the door?' When the devil sees the Lord Jesus, he bows low and says, 'I am sorry. I have come to the wrong door,' and he turns and leaves." The Christian life is a love relationship. Christ is not only my Best Friend, but He is my "Beloved." No one loves me more than Christ. He gave His life for me. No one ever loved me like that. Christ loves me with all His heart. When you love someone like that, the thing you want most of all is for that person to love you the same way. That is exactly what Christ wants. He wants me to love Him with all my heart. It is easy to say, "I love the Lord Jesus," but the proof of my love is my actions. Jesus said, "He that has my commandments, and keeps them, he it is that loves Me…" (John 14:21). Is He pleased when I hang around with those who use bad language and do wrong things? No, He is not. Is Jesus pleased when I watch movies and television with bad stuff? No, He is not. Is Jesus pleased when I listen to music which has dirty words in it? No, He is not. If I truly love the Lord Jesus, I will not want to do anything that would displease Him or make Him ashamed of me. "Delight yourself also in the Lord; and He shall give you the desires of your heart. Commit your way unto the Lord; trust also in Him; and He shall bring it to pass" (Psalm 37:4-5). A Christian is a person in whom Christ lives. 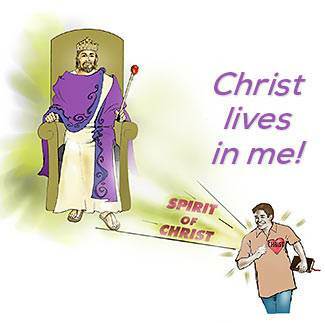 Christ Himself is in Heaven, sitting at the right hand of God, but He lives in me by His Spirit. Christ is God's greatest gift. God meets my needs by giving Christ to me, to live in me. The secret of the Christian life is depending on Christ who lives in me. He is God! He can do anything! I must practice turning things over to Christ and depending on Him. He loves for me to do this! When Moses chose to obey God, it seemed as though he had thrown his life away. For forty years he was an obscure shepherd in Midian. 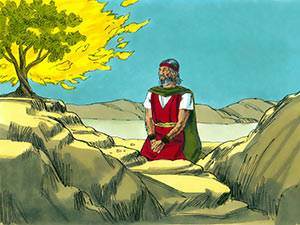 Then, one day, God appeared to Moses in a burning bush. God told Moses that he was to go to Egypt and bring His people out of Egypt. God told Moses to go to Pharaoh and say to him, "Thus says the Lord, Israel is My son…and I say unto you, Let My son go, that he may serve Me…" (Exodus 4:22-23). Moses and Aaron delivered God's message to Pharaoh, but Pharaoh said, "Who is the Lord, that I should obey His voice to let Israel go? I know not the Lord, neither will I let Israel go." God sent nine great plagues on the land of Egypt to cause Pharaoh to let Israel go. Each time Pharaoh would seem to change his mind and promise to let Israel go if the Lord would take away the plague. But when the plague was removed, Pharaoh would harden his heart and refuse to let the people of Israel go. Finally God said to Moses, "Yet will I bring one plague more upon Egypt; afterwards he will let you go." The final plague on the land of Egypt was that the Lord would pass through the land at midnight, and the firstborn son in every family would be killed. The children of Israel were told to take a lamb for each family. The lamb was to be killed and its blood collected in a bowl. 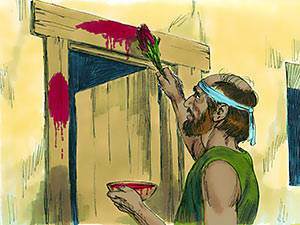 Using a branch of a bush, they were to put the blood on the two sides of their doorway and on the top of the doorway. God said, "…when I see the blood, I will pass over you…" (Exodus 12:13). At midnight, the Lord smote all the firstborn in the land of Egypt. There was not a house among the Egyptians where there was not a dead son. Even Pharaoh's eldest son was killed. But in the homes of the children of Israel, the firstborn sons were spared. What was it that saved Israel's firstborn sons on that awful night? It was the blood of the lamb. What is it that saves us? It is the blood of Christ, the Lamb of God. Pharaoh called for Moses and Aaron and told them to leave Egypt and to serve the Lord as He had told them. The Egyptian people also begged the Israelites to leave and they gave them silver, gold, and precious stones. The children of Israel went out of Egypt with great wealth. There were about 600,000 men, besides the women and children. 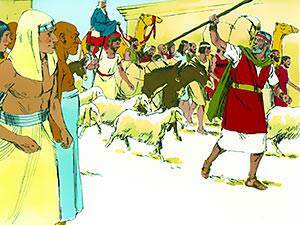 They took all their flocks of sheep and all their herds of cattle. God took His people out of Egypt, a type of the world, that He might have them for Himself. This is what God is doing now. He is saving people and taking them out of this evil world that He might have them for Himself.